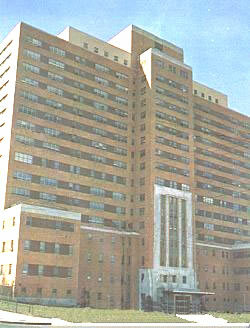 Early in 1953 plans were completed for the 17 story building which will be ready to receive patients in 1955. In the meantime the present City Hospital on Fairmount Avenue will continue to care for the needy. The construction of the new City Hospital will consist of structural steel framing, concrete floors, interior and exterior walls of masonry, with all doors, widow trim and cabinets of metal. The lower floors will be used for laboratories, X-Ray, operating, delivery, central supply, administration and heating plant. Bridges will connect it with the old building, which was originally built to care for300 patients, but which during the last few years, has been taking care of 700. The new Hospital building will care for 738 patients and the old one, when rehabilitated will care for an additional 138.